I am always looking for new and interesting ways to cook carrots. I am also always looking for a reason to cook Persian. I found this glazed carrot recipe on the blog karenfood.blogspot.com. Actually it's only one of many tasty recipes that I want to try from this blog. Don't be afraid of this dish. It's candied carrots glazed in brown sugar and ginger. What makes it "Persian" is the addition of almonds, raisins and dates. I had everything I needed, except for the dates, but didn't think it would affect the final outcome too much, and it didn't. We really enjoyed them. 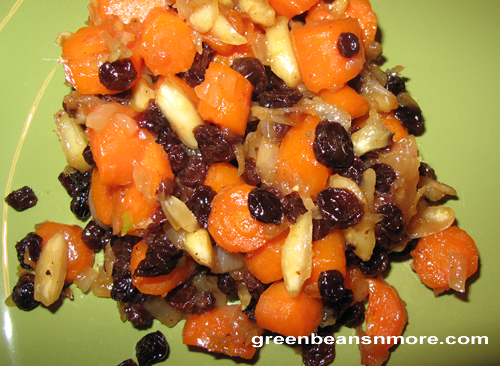 The almonds added a wonderful nutty flavor, the raisins (I used currants) add sweetness and the grated fresh ginger just a bit of warmth. This glazed carrot side dish would be a tasty compliment to any meal. In a sauté pan on medium high heat, sauté onions in butter until beginning to soften. Add sliced carrots and stir. After a few minutes, add the raisins, almonds, dates, ginger and salt and pepper. Continue cooking for several minutes until the carrots begin to soften. Add brown sugar and reduce heat until ready to serve.